Douglas Haig Gross was the son of Frank David and Nellie Pauline (nee Pride) Gross of Vancouver, BC. He had one brother, Aubrey, and one sister, Rowena. The family was Anglican. On one form, his birth year is 1917. On another: 1919. He indicated he spoke English and French (high school and one year university -- passed). He like to play basketball, golf, tennis, swiming, track and other sports. He had brown hair and blue eyes, stood 5' 8 1/2" tall. He weighed 149 pounds. He smoked 12 - 15 cigarettes a day and had the occasional beer. He had been a salesman at Planters Nut and Chocolate Co. Ltd. When he was assessed proir to enlistment: "Bites nails. Appears well enough controlled otherwise. Keen, alert, intelligent. Seems stable and well adjusted. Wants Pilot. Good family background. Clean cut, alert, and observant. Possesses intelligence and personality. Should succeed." At No. 2 ITS, Regina, Saskatchewan: July 15, 1941 - August 15, 1941: 24th out of 224 students. 87%. "A dependable type of airman, well matured, can think for himself, applies himself well, has a good sense of responsibility and shows definite signs of leadership qualities. Has had three years university training, stood 24th in his class and is recommended for a commission." At No. 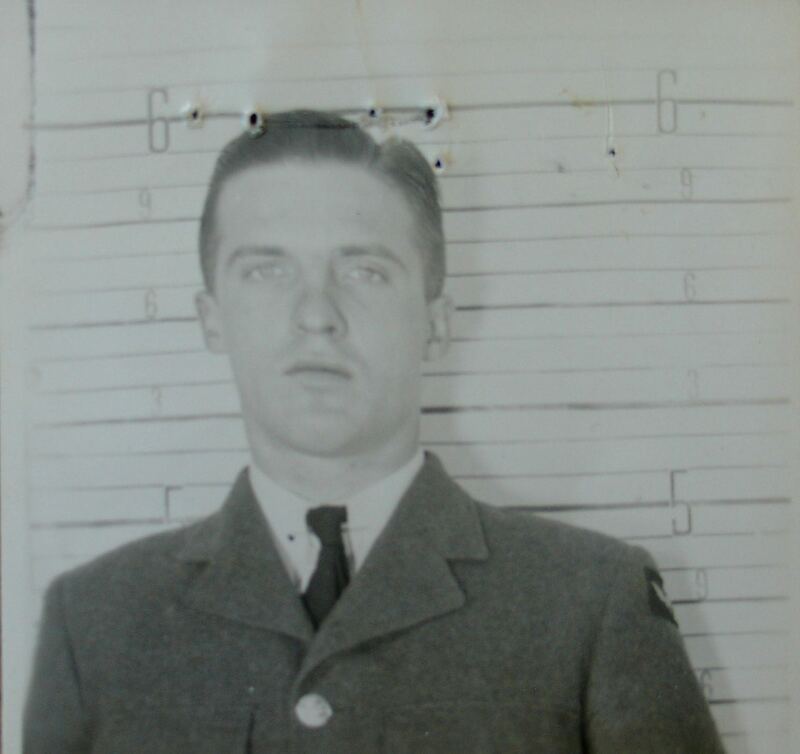 2 EFTS, Fort William, Ontario: September 1, 1941 - October 24, 1941: "Keen and ambitious. Very good progress. Requires practie on cross wind work and precautionary landings." Ground training: 83.3% 6th out of 30 in class. "Self reliant, gifted and dependable." At No. 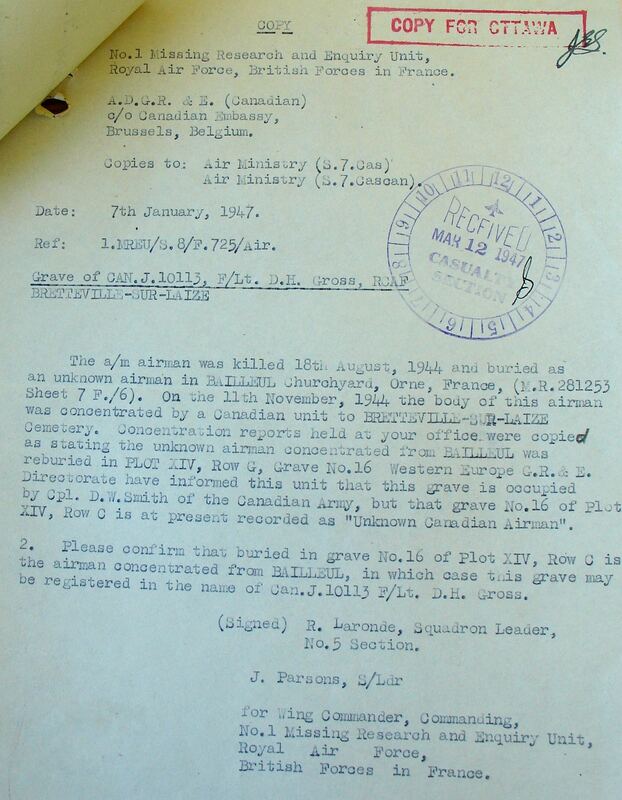 13 SFTS, St. Hubert, Quebec: October 27, 1941 - January 16, 1942: "A reliable pilot of high quality. Works hard, intelligent, keen, conscientious. Displays good judgment. Excellent pilot material." Ground Training: "Good average in GIS. Good manners, education, intelligent and appearance." He was recommended for Fighter pilot and it was his preference as well. "Above the average in general ability. Steady and reliable on instruments. Very dependable. Should go far in the Service." He was 12 out of 48 in his class. He was sent to Halifax on April 29, 1942 and arrived at the RAF Trainees' Pool shortly afterwards. From there, he was sent to 3 PRC, 17 (P) AFU and then 59 OTU. 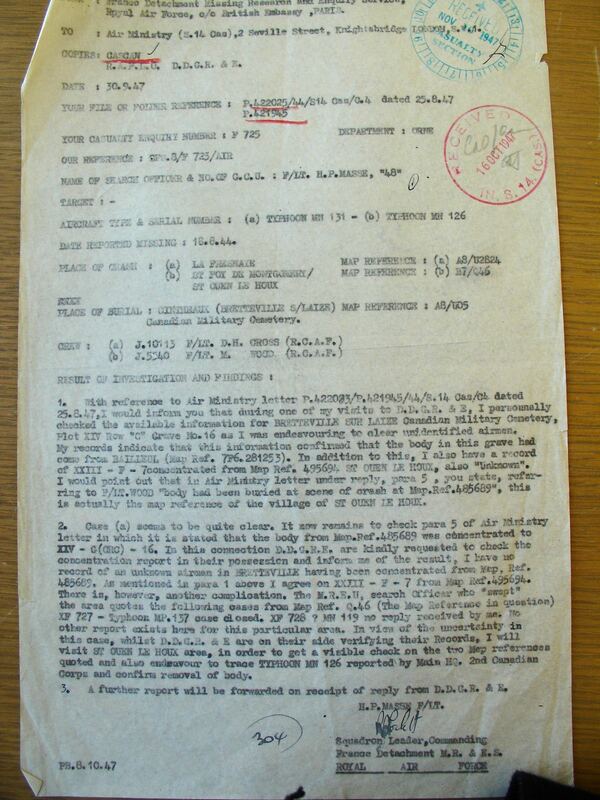 In October 7, 1942: "An above the average pilot who is keen, steady and reliable, and works hard on the ground. He is a good fighter pilot and should be a very useful member of his squadron." He had been at No. 17 AFU and was posted to 245 Squadron at this time. In December 1942, he was involved in an accident that occured at night while Gross was practicing circuits and landings. He was given further instructions on night landings and was to practice more circuits or landins by day before flying again at night. It was noted that weather conditions were "tricky at the moment and it would have been wiser if the pilot had deferred anding until the rain squall had blown over." He was injured on January 17, 1943 when Typhoon 1B ND312, the engine cut out. He suffered from a concussion with some retrograde amnesia, as well as a minor laceration of the scalp. He was in the Cossham General Hospital for 19 days and made a good recovery. Gross felt fit and his confidence in flying was not impaired, according to his medical records. Gross's view was obscured by grease on the windscreen flung by the power of the propeller. 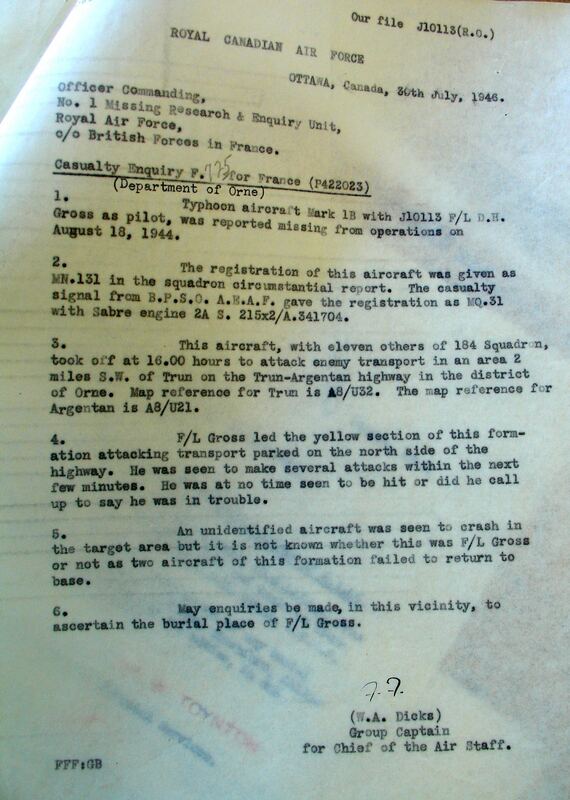 On August 18, 1944, Gross was killed flying Typhoon MN 131. His aircraft, along with 11 others of 184 Squadron took off at 1600 hours to attack enemy transport in an area two miles SW of Trun on the Trun-Argentan highway in the district of Orne. F/L Gross led the Yellow Section of this formation attacking transport parked on the north side of the highway. He was seen to make several attacks within the next few minutes. He was not seen to be hit or did he call up he was in trouble. Gross was buried as an unknown airman in Bailleul Churchyard, Orne, France. On November 11, 1944, his body was concentrated by a Canadian unit to Bretteville-Sur-Laize Cemetery. Effective May 15, 1945, Gross received the US DFC. "In recognition of gallantry displayed during recent operations in Arnhem" with 184 Squadron. "Gallantry - Operational - Flying in Conflict."